Dozens of people stormed the national Muslim Brotherhood headquarters early on Monday following overnight clashes between protesters and those inside the building, leaving at least eight dead. Cairo's prosecution has started investigations into the incident, with a t11eam of criminal investigators arrived at the scene to inspect the site. Protesters there reportedly chanted against the Brotherhood as the investigators arrived. Hundreds surrounded the headquarters in the isolated Cairo suburb of Moqattam on Sunday night. Some threw rocks and petrol bombs at the building, which caught on fire as guards and Brotherhood members inside the building exchanged gunfire with the attackers. One of the Brotherhood members was beaten and is currently in critical condition, according to state news agency MENA. When protesters eventually broke into the building this morning, those inside had already fled. The contents of the torched building were ransacked. Ahram Arabic news website reported people removing furniture and other items from the building and loading them onto motorcycles. Muslim Brotherhood spokesperson Ahmed Aref and leading Brotherhood figure Mohamed El-Beltagy have condemned what they described as the police's "failure" to protect the group's offices nationwide and the its headquarters in Cairo's Moqattam. Aref said in a statement on Monday that "thugs" surrounded the building all night and "fired gunshots and threw Molotov cocktails as those injured lay inside the headquarters." "Ambulances were not able to reach for them and security forces were completely absent," he said. El-Beltagy stated that: "it isn't about a building or the symbolism of the headquarters; what is more important is the victims who fell dead or injured." "This reveals the lies of those who claim to hold peaceful protests, and their criminal agendas," he added. El-Beltagy condemned the "political forces and rights organisations’ silence" about the incident and criticised the police's "inability or reluctance to stop the attack." Opposition groups have distanced themselves from the attack, stressing the peacefulness of the protests. The NSF released a statement on Monday condemning the violence at the headquarters. "We totally and wholeheartedly reject such practices," it said. On 11 June, Interior Minister Mohamed Ibrahim said that police will only protect state institutions, not the Muslim Brotherhood headquarters, during opposition protests on 30 June. Millions of Egyptians took part in nationwide protests on Sunday calling for Morsi to step down and for early presidential elections to be held, with major rallies being held at the Ittihadiya presidential palace in Cairo and in Tahrir Square. At the same time, tens of thousands of mainly Islamist supporters of the president continued to stage an open-ended sit-in outside Cairo's Rabaa Al-Adawiya Mosque, ongoing since Friday. 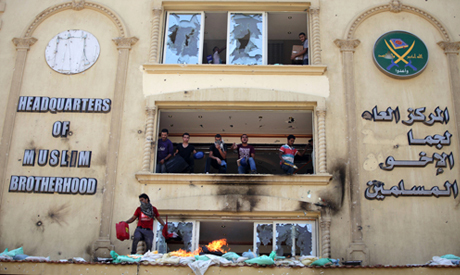 A number of Brotherhood buildings have come under attack as tensions have mounted in the lead-up to the 30 June demonstrations, with the group's offices in Alexandria and in the Nile Delta governorates of Sharqiya, Gharbiya and Beheira being firebombed or ransacked. The Brotherhood's headquarters in Moqattam was the target of several similar attacks this year. In March, intense clashes took place between hundreds of Muslim Brotherhood supporters and opponents near the headquarters, leaving about 200 injured. Correct Medo, and the 14 yrs old boy that was killed in Mokattam did not have a weapon, his teenage curiosity prompted him to just take a look to see what was going on, now he is dead and buried in his village. So Al-misry you are more than welcome to come to Mokattam and present your views to the parents of the slain teenager! There is evidence from by standers the attack came in early hours of the morning. No child was about then. Attackers were wearing crosses and are linked to Copts. Islamists restrained from violence . On Friday they came under attack. Yesterday attack continued. Now it has come time to seek out leaders of the thugs and bring them to justice.